With Russia now blanketed in snow, winter is in full swing in the country. RIR selects 7 places where you can enjoy the season at its fullest. Sledding or riding in a troika (a three-horse sleigh), snowboarding down the slope of a volcano, swimming in the unfrozen lakes and other activities that distract you from the cold and teach you to love the Russian Winter. Here are 7 places to try out winter activities. For some parts of Russia, minus 40 °C is a normal winter temperature. That is where the “cold pole” is situated – the perfect place to test your endurance. This is the most severe place on Earth, with a permanent population. Record low winter temperatures fall here down to minus 77 °C, while in summer they can be up to +30 °C. Winter temperatures generate amazing phenomena. For example, the one that the Yakuts call “star whisper” – in freezing temperature, people hear all the time a soft rustle of their instantly freezing breath. You may get there with Yakutia Travel or Visit Yakutia. The Urals form the border between Europe and Asia, and are the oldest mountains in the world, countless nature reserves and ski slopes, stories about UFOs and natural anomalies, the story of Dyatlov Group’s mysterious death and many people wanting to re-travel the route. In short, a winter in the Ural Mountains is for fans of extreme sports and a little mystery. Here you will be taken to the abandoned and existing metallurgical plants, offered to spend the night in a former gulag camp, you will have a chance to see one of the longest caves in the world, and in general, do whatever you want. The tourist infrastructure in the Urals is one of the most developed in the country. Ural Travel Agencies: Krasnov (Perm), Welcome-Ural. The ring route around Moscow, consisting of dozens of ancient cities, two of which are on the UNESCO list, is perfect at any time of year. However, these are worth a visit especially in the winter, for two reasons. First, in Kostroma and Uglich, being the part of the route, there are the residences of Ded Moroz and Snegurochka (Russian Santa Claus and his granddaughter). If you are traveling with children, a visit to Ded Moroz will be a real treat for them – the main thing is not to let them lick the Snegurochka’s icehouse. Second, the Golden Ring of cities offers the widest range of winter activities – a la Russe: riding a troika through the snow-covered forests, royal toboggans and many other amusements, the existence of which you may not even suspect. The deepest and cleanest lake in the world – Lake Baikal – is located in the heart of Siberia. For 10 consecutive years, in winter, the International Marathon is held, where participants run 42 kilometers on ice on this lake. There are no usual entertainment activities such as mountain trails or expected Siberian snow banks. However, the lake water is so pure, that three meters down through the ice you can see the frozen algae and scattered air bubbles. Many photographers specially come here in the winter to take pictures of the ice. Here you can skate, take a course in Siberian herbal medicine, as well as significantly improve your health – the healing properties of Baikal water become many times stronger when it freezes. For more information check waytorussia.net or Lake Baikal website. The relief of Kamchatka Peninsula is so varied that a professional snowboarder cannot “run over it” even in 20 years. Winter is the high season here – the “highlights” of the peninsula are heli-skiing and backcountry. And it is possible not only to ski down from the mountains, but also on the slopes of volcanoes. In addition, in winter you can go jeeping or take part in a trek to volcanoes or geyser valleys without the fear of encountering bears. Check out various tours with descriptions on different local websites (in english) and choose the one you want:http://foresteam.com, http://omega-tours.ru,http://www.kamtrekking.ru/tours. 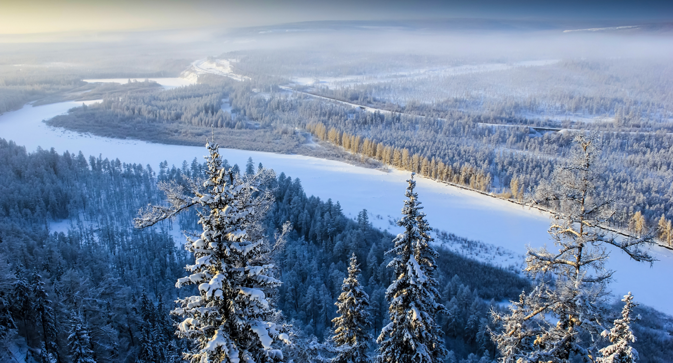 The Altai, a mountain range in the south of Siberia, is just a storehouse of winter amusements. You can take a trip on a horse, or a ski tour, or ride a snowmobile, participate in under-ice fishing on Lake Teletskoye, hunt, take a Russian steam bath and, of course, go skiing and snowboarding. In addition, winter is the only time of the year when you can see the most high-altitude ice caves, as well as test your strength and bathe in the Goluboye (Blue) Lake that does not freeze at temperatures of 30 degrees below zero. Sib Alp Tour Company takes travellers by jeep from Novosibirsk. Eco Tours runs group trips for two to 12 people for nine to 18 days, specialising in the region’s cultural or natural treasures. The hottest winter in the literal and figurative sense, will be in the Caucasus – first, the temperatures there really are very different from those in most of our country, and second, it is in nearby Sochi where the Winter Olympics will be held this year. However, even on the Black Sea coast, there will be quite a lot of snow – so guests of the Olympics can take a stroll among palm trees and relic eucalyptus forests, and then, having reached Krasnaya Polyana, located in the mountains, go skiing and snowboarding. By the way, the Caucasus also has the highest peak in Europe and one of the most famous ski resorts of Russia – Mount Elbrus (5,642 meters).